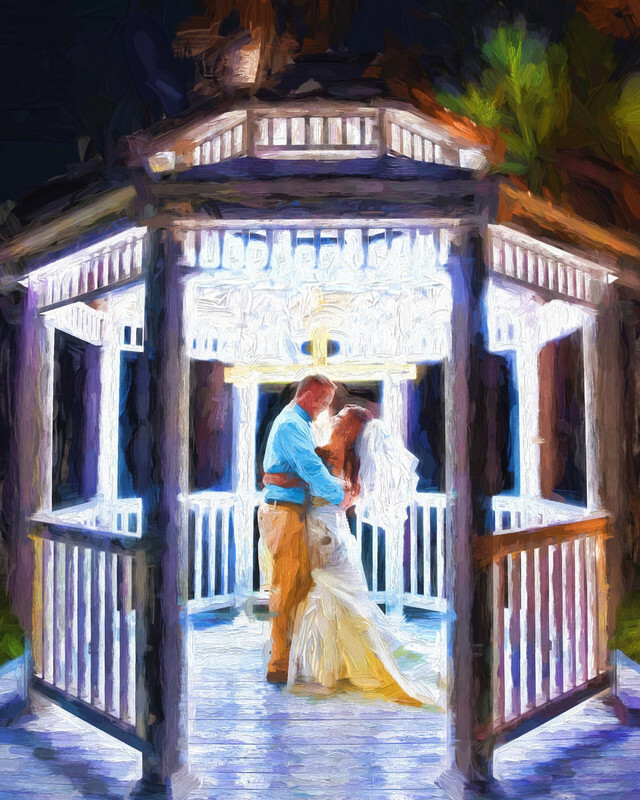 Private Dance in Gazebo in Oil Painting like rendition. September 25, 2014. This great wedding image was taken at Pietros on the River in Hutchinson Island, Florida. With the full moon over the water in the background, we talked our couple into venturing out for some quick portrait shots. (which is harder to talk folks into than you'd think once the wedding reception is in full swing). We chose to uniquely light this portrait with hidden strobes inside the gazebo, which rendered them aglow, and really makes this wedding dance image one of our favorites of the year. This rendition of the image has also been retouched to look like an oil painting. By adding both texture and actual brush strokes, this type of embellishment, really transforms an already great wedding image, into an actual work of art, which beckons to be hung on the walls. It's hanging on the walls of our bride and groom, and its also featured in our studio. Location: Pietros on the River, Hutchinson Island Florida.